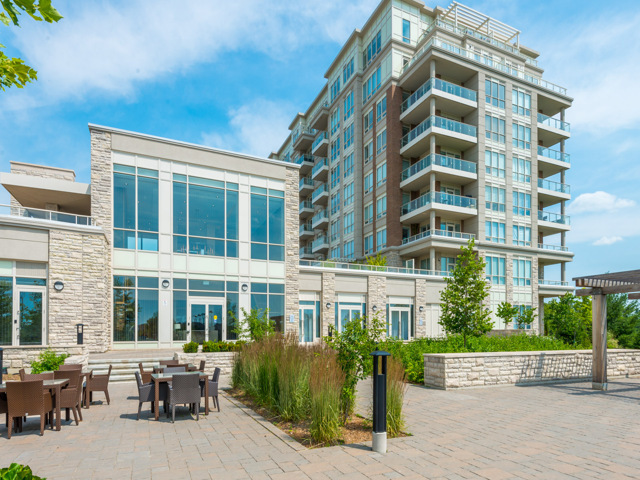 Beautiful brand new penthouse in one of the most desireable locations in the GTA overlooking Angus Glen Club golf course in Markham. This is the '6th Angus Glen'. Imagine sipping your favourite beverage on your private terrace watching the golfers below play their round while the sun rises and sets in this South / South-east facing penthouse. With access to swimming pool, whirpool, gym, party room, billiard room, dining room, security, beautiful entrance and communal area. Rarely available unit in one of the most sought-after locations has now come-to-market via an exclusive listing directly from the owner. 10th floor, with 10ft high ceilings. Rarely available: 2 parking spots and 2 lockers (standard is 1 parking +1 locker). Larger size unit at 1,096sq ft living + 145sq ft terrace for a total 1,241sq ft.
Master Bedroom with walk-in closet and private en-suite with his & her sinks + shower + bathtub. Bedroom 2 with walk-in closet. Excellent-sized den provides flexibility; can be used as a study, home-office, bedroom 3, arts & craft room, extra storage. Large open plan kitchen, living & dining room overlooking the terrace and golf course. Also included: Wolf Stove, built-in fridge and freezer, dishwasher, wine cooler, washer & dryer, high-end curtains with heavy duty blackout liner. This property for sale has been tagged by the seller as close to Richmond Hill, Scarborough, Stouffville, Unionville, Whitchurch-Stouffville, Ontario. Thank you for viewing this For Sale by Owner property in Markham, Ontario.